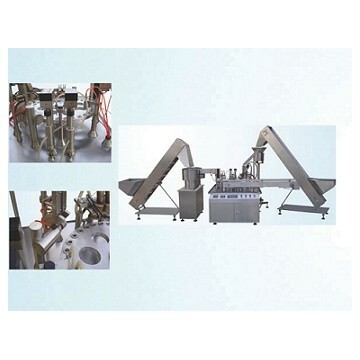 This machine is easy folding plastic vial filling capping equipment, can automatically finish bottle feeding, bottle unscrambling, empty bottles leakage detecting , filling, cap-feeding, capping, and outlet. It uses advanced filling technology, accurate measurement, durable pump body, hot melt sealing technology to ensure the reliability of sealing. It uese PLC control technology, high automation, convenient operation, advanced control, with no bottle or waste bottle no filling, no cap-feeding, no sealing and automatic waste bottles elimination and other functions to ensure the equipment meet GMP requirements.